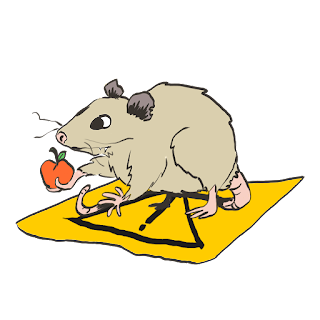 The Caution Possum would like you to be aware that this book, and therefore this article, contains references to sexual violence and torture. Please take care of yourself and your mental and emotional health by turning back now if that discussion may be upsetting to you. Thank you, and have a great day! I've probably started, deleted, and restarted this review a dozen times since I began this blog. Carcosa is a complex book, and it's complicated (for me, at least) to review adequately. I have a few conflicting feelings about some of the book, and because of that I think about this book a lot. Like, very regularly. That alone is probably a testament to Carcosa and its author, one way or another. But regardless, it has been a challenge to properly put my final thoughts down on paper when my thoughts are still busy all these years later. No more restarting this article, though - let's give it a go, once and for all. Carcosa is a setting book for use with your preferred OSR system (though you could also play it in 5E with some numbers work, I am sure). It was originally produced by Geoffrey McKinney in 2008, and won big in 2011 when it was reprinted in a "complete" format by Lamentations of the Flame Princess. Carcosa generated considerable controversy when it was released, and has continued to do so over the years since then. James Raggi IV of LotFP has often invited controversy, or at least never shied away from it, so it is no surprise whatsoever that the book has been a successful part of the generally excellent Lamentations lineup for years. The world presented in Carcosa is Lovecraftian and horrifying. It is violent and barbaric science fantasy, sort of like a sword and planet pulp world viewed through a kaleidoscope of carnage and unforgivably dark magic and ancient evils and a complete lack of morality. It pits the players against a harsh and unyielding world where they are an endangered species by default, where a happy ending is extraordinarily unlikely. The setting is extremely interesting. It is a brutal place. It is so incredibly grim, so unyieldingly horrific and agonizingly unpleasant and hostile to life that it seems practically hopeless and pointless to fight the uphill battle to improve it at all. Yet, that's exactly what you do. The rewards for doing so are not commensurate to the task. The world of Carcosa is dangerous, malevolent, sad. It is fascinating to read about, but running a game there is a bizarrely tall order unless you are fully committed to the gimmick of an amoral or cosmically immoral universe being made aggressively clear over and over. It is a place where the magic is awful beyond belief, but possibly necessary depending on the threats faced to encourage its use. Visually, Carcosa is good. It's not incredible, but it's good. Rich Longmore's art is perfectly suited to the grim science fantasy, pulp-influenced world of Carcosa, and the decorative pieces framing pages throughout are terrific. The intricate detail and style of his work is really appealing to my eye and honestly I'd love to see many more books with his art. (If Chance Phillips happens to read this - I want to see Rich draw pictures for a future Phantasmagoria zine. Make it happen!) I really appreciate what Rich added to this book. In terms of layout, I feel like Carcosa is one of the weaker darlings of the OSR. I don't think it's due to any failings of Eero Tuovinen, to be clear - the indie DIY D&D movement has just produced so many incredible books, each year improving on the last, that by comparison Carcosa is a little bit uninspired and, dare I say it, dated. It is clean and you can read it, but it is not as sharp as so many of its fellows and at the table it lags behind other books. Carcosa is held up as a Very Important Book by some (more for its content than its design, to be clear) and so it is hard not to hold up against other Very Important Books and find it very much an artifact of the past. I can't tell you how it would stack up in 2011 under scrutiny with other releases from the same time frame, but looking at it regularly in the years since and looking at it freshly as I write today, it is simply perfunctory, and not particularly efficient at that. Let's talk about the meat of the book: Geoffrey McKinney's world, his words, his creativity. First, the good parts, because I want to stress their value. Mr. McKinney is a gifted, if verbose, author. His descriptions of things are rich; they invade your mind and are easily visualized. This is a gift surprisingly few authors in role-playing games actually possess, though the DIY indie scene is very lucky to have many of those who have it. The world of Carcosa comes alive with ease through Geoffrey's writing, and it is very difficult indeed to walk away from this book without your mind running wild. It is thought-provoking and unique. As I mentioned above, it is a huge testament to this book and to Geoffrey McKinney as an author that I have thought about this book very regularly - at least weekly, if not more - ever since first reading it the better part of a decade ago. I think about it a lot, and that's because Geoffrey writes incredibly well. Also to this book's great credit is the imagination of it all. There is a scale to the imagination behind this setting which is more Lovecraft than Greenwood. It is less about the concerns of generations of elves and favored wizards and wholly approachable, comprehensible gods in a structured system; instead, it is much more about the sheer immense age and inescapable, unfathomable old dread of the universe encapsulated in a place where alien brutality is the norm because that is simply the norm everywhere. It is a huge setting, with a cosmology and level of nested detail which focuses far less on the accessible and far more on the overwhelmingly hostile. These themes aren't necessarily my favorite themes, but the scope of it, and the comprehensive way McKinney develops and describes it, is second to none. There's no way to honestly discuss the content of Carcosa without addressing the proverbial elephant in the room. The book's extensive ritual magic section is riddled with graphic instances of torture and sexual assault, at times directed toward minors. It's uncomfortable to read, and though I am personally very far from a wilting flower on the subject of violence, even I wince at some of it. At various times, since reading and rereading this book over the years, I have felt it to be gratuitous and probably avoidable. At others, I've felt that the setting's inherent horror and inhumanity, and specifically the evil and repulsive nature of magic itself, could never dispense with such visceral reminders of the dangers of powers which at best might be the lesser of two evils depending on the threat it may be interdicting. At no point in my back and forth would I have wanted, or tolerated, outside opinions censoring Mr. McKinney's work. But I have indeed had this back and forth, and I believe I've settled: it is uncomfortable, it is gratuitous, but it is unique and it is consistent and it is immersive, and above all it is unquestionably effective at evoking the desired gut response to the vile nature of ritual magic in Carcosa that the setting demands. It is unforgettable and makes the setting similarly unforgettable. Presuming this was Geoffrey's goal, which I think is a reasonable presumption, he achieved it in spades. A positive of the magic system is that many of the rituals are inherently adventures/hooks themselves. Many have very specific, rare components (even without counting those which require very specific sacrifices...) or have extraordinarily detailed requirements with regard to location, temperature, weather, time, or cosmic standing. This makes the magic feel tied to the world, and therefore forces the characters to be tied to the world. In the one-shots I've played in Carcosa, more than one was predicated entirely on casting or preventing a ritual. These are the easiest hooks in the game. Many spells require you to go to XYZ to collect or use ABC which means just as easily they can force you to go to XYZ to stop someone else from collecting or using ABC. More games should make use of this sort of integration of mechanic and hook. One criticism I hold toward this book is the bizarre lack of detail for the namesake city itself. Carcosa, for those who are somehow unaware, is a fictional city invented by Ambrose Bierce and later borrowed and expanded upon by Chambers and Lovecraft. It is an alien, mysterious place. For a book titled Carcosa, there is a surprising lack of the specific city of Carcosa. The book manages to set the stage for alien, unnatural adventure nonetheless, but it leaves a puzzling gap. I feel like you write a book about Carcosa, you need to include at least some reasonable amount of Carcosa itself. You wouldn't write a book called Castle Greyhawk and not include Castle Creyhawk. It's a strange omission. Another criticism is the hit die mechanic. There is no way I'm going to reroll every player's hit dice at the beginning of each combat. Am I missing out on some sensory experience the author intended? Some swingy danger necessary to enjoy the setting? I don't think so. From where I sit at the table, it adds nothing to my enjoyment of the game. I recognize this is purely subjective, but then again, what about my reviews isn't? For those unaware, the book instructs you to roll on a table to determine which hit dice size to roll, and then you roll as many of those dice as your character has hit dice and total the results to determine your HP for that combat. You do this at the start of each battle for each character. I must convey strongly: hard pass. I can't be sure I understand the rationale, but anything that removes sense of progress, lengthens or complicates combat, and makes things unpredictably swingy beyond the normal randomization of to-hit and damage rolls seems questionable at best to my tastes. I also find some of the hexmap keys listed in the book to be quite boring, and questionably useful. At times a random monster encounter table would be more interesting and more valuable than the provided keys. Others are, by comparison, tons of fun; some are exciting enough to launch a campaign all by themselves. I do not recall how I felt about this when I first read Carcosa in 2012 or so, but in the years since, as I've reflected on the book, I've grown less and less satisfied with the keys overall and wish as much time had been spent making them exceptional as was spent making the ritual magic impressive, arcane, obscure, and unpalatable (on purpose). When I read Carcosa, I find myself drawn into the innate horror of the setting. When I contemplate running a long-term campaign there, I find my enthusiasm wanes a little. I've played in my share of one-shots/short campaigns, and I've run a one-shot. But I feel like the bleakness of it makes the unlikely heroism of D&D very hard to enjoy, and so it doesn't appeal to me as a full setting despite the breadth of material presented; there's enough Carcosa in this book for years of play, but I cannot fathom doing so. I'd need a lot more fluoxetine to manage that. Because of this, I feel like Carcosa is best suited to one-shots or short campaigns, and probably contains more than it needs to (and some of what it has would probably be stronger if it were edited down to focus on that style of play, yknow?). I feel like Carcosa is something best stripped for parts - because there are so many absolutely brilliant surges of unrestrained imagination in it - rather than played straight. Have a magic mirror teleport the party here and make them stop a ritual or perform a ritual to solve a problem in order to get back. That kinda thing. As I said, reviewing and rating Carcosa has been an unbelievably difficult task for me. I have struggled with this article since I began this blog. On some days I would think I'd wind up giving it a perfect score for its imagination and the quality of its art and writing. On other days I would give it a much different, harsher score for trying too hard in some places and not quite hard enough in others. Easy for me to say, I suppose; I didn't try to write an entire setting from scratch! I try very hard on this blog to be objective (in my subjectivity), to be honest, and to review products I would recommend and enjoyed reading. I enjoy reading Carcosa, even the parts that have made me uncomfortable here and there. I am never sure on a given day, however, whether or not I would recommend Carcosa as-is, without the caveats I've discussed herein. With the most difficulty of anything I've reviewed on this blog, I give Carcosa seven horrifically sacrificed Jale trash monsters out of ten. WHAT?! A new rating system?! Yeah. After some thought I decided it was much more representative of my thought process for others if I used a ten-scale; just because I know I am only reviewing books that excite and interest me enough to be in the top 50% of books to begin with, doesn't mean that the casual drive-by viewer knows that. As I said above, I have sometimes struggled to pin down a score for this book. 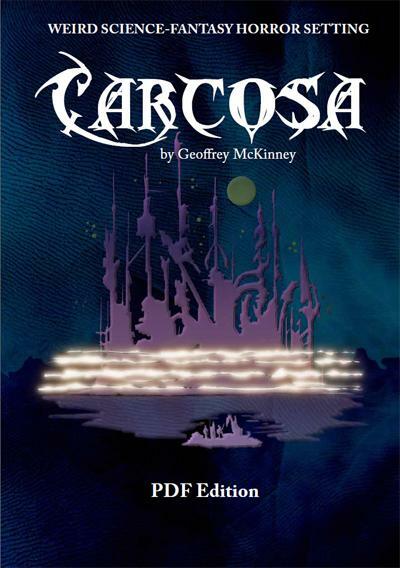 However, at the end of the day, Carcosa is one of the most enduring, interesting books I've read in the entirety of the OSR/DIY world, and it hasn't left my mind since I first read it seven or eight years ago. That counts for a lot - few books can claim the same. But there are inconsistencies in quality (to my tastes, anyway) and depth, and I think if it were structured differently it would be much stronger for it. I also think the layout is a little weak now, though for 2011 it was certainly doing the job. These things hold it back from scoring higher on my arbitrary and stupid rating system. Geoffrey McKinney is a very evocative, exciting author to read, and Rich Longmore's art is great. I hope there's more in the future from both! Well, there you have the hardest review I've had to write so far. Agree? Disagree? Loathe my horribly pedestrian tastes? 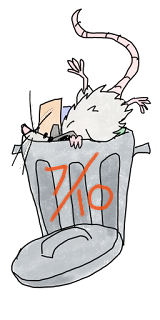 Have a specific gripe against Jale possums? Contact me in the comments and hit me up over on Twitter where I post way too often as @dungeonspossums. The rules for randomising Hit Dice with every combat are quite bewildering, I have to wonder if anyone actually uses them? I checked my copy to see if I was remembering them wrong and it turns out you're also supposed to randomise damage dice with every hit? I'd quite forgotten that. When I played in a Carcosa campaign several years ago, we used all the funky dice rules. After a couple of sessions, it became pretty second-nature and wasn't too complicated. It added another layer of unpredictability and danger to combat. That said, I'm not sure a lot would be lost if you decided to skip the weird dice rules. As I recall reading elsewhere, McKinney himself doesn't even use them. Hazarding a guess here, I think that's absolutely the core desire of the rules - to make every combat new, unpredictable, unreliable. There's a certain soft math we can all do after a little while where we know that our party can outdamage six orcs with spears but not eight, yknow? I cannot say for sure (it's purely my speculation) but I think he wanted to ensure that was not possible, so every combat carried new and fresh tension and dynamics. I appreciate the sentiment very much, but I don't wanna do the work inherent to it to get there, personally. We found that the dice rules really shaped our behavior. When things are that swingy, a third-level party who gets lucky on HD rolls at the start of a combat can take on a 15HD Jale Worm but maybe not a small band of raiders if the rolls go wrong. So positioning in the fiction became more important than in a lot of more normal D&Ds. Some things that were super-important: fortifications, having escape routes planned out, using bombs as distractions instead of weapons, being able to start a fight, bail out, and come back to start it again after a couple hours. Those are all things you might do in any game, but Carcosa incentivises them more. After further consideration, I feel like I see the point, but it's a little *too* unpredictable for my tastes. I think maybe I'd randomise Hit Dice daily. Sorcerers can determine what type of die it is in advance by plotting astrological details and cross-referencing the phases of the moons. Everyone else has to find out the hard way. I've mentioned elsewhere that I think Carcosa's strength is that it is potent enough to inspire people and flawed enough that they want to adapt/change/fix it. "Here is the template, do with it as you please." is a good starter point for an RPG book. That's a very interesting phrase to describe it! :D I hadn't considered that the desire to tweak and "fix" it to your liking is part of the enduring charm of the book, but since that seems to be a quality common to D&D itself, it certainly seems plausible! For me, I want to condense it down to half the size and make everything more dense and "active". There's so many brilliant ideas but I feel like I want more going on everywhere. At the same time, though, I think the scale, the emptiness, the sense of desolation and variance are very intentional. As I said in the article, I think about this book constantly. It's very hard to get out of my mind. A good deal of inspiration comes from incompleteness. if I were running a game in Middle Earth I would play in the East because that's the stuff we don't see and so creativity has free reign.